How often do Irish fashion bloggers get to discuss ‘what to wear for a summer garden party’ and write it without getting sore eyes from all the rolling? Not very often you won’t be surprised to hear. But, like for everything else, there is an exception to the rule – and here it is! I do not need to bang on about the glorious weather we are experiencing in Ireland, Irish readers don’t need any more reminding and readers abroad don’t care. But I have to say it is so refreshing to flick through fashion mags and be able to actually nod in agreement – ‘Yes, that aztec print crop top WOULD be perfect for brunch outside this Saturday’ – and laugh ‘Oh Paloma Faith, why would you wear black tights in this weather?’ She actually did wear black opaques out and about in London this week where they are also experiencing a heatwave. Anyway, let’s assume that everyone in Ireland has a party to attend this weekend and had planned their outfits to accommodate the real Irish summer. And let’s assume that the party in question will involve Prosecco and canapés, not Dutch Gold and crisps. In all likelihood female guests would have planned a nice summer dress despite the expected greyness and strong likelihood of rain, because it’s supposed to be summer. So that’s a good start. The problems lie with how much skin you want to show, if you want to bare your feet (I sure don’t!) if you are prepared to spend valuable time tanning yourself (by either sunbathing or faking it) hair up or down, make-up or bare face…the heat takes so much out of you already you do not need this kind of stress! 1. Forget about heels – they will only sink into the grass and you would eventually just kick them off. What’s the alternative? Ballet flats or fancy sandals and flip-flips if it’s casual, but don’t wear a fancy dress and your dirty old exercise shoes – that’s simply never a good look. 2. Bring a pashmina/big scarf – It can act as a make-shift picnic blanket, can warm you if it gets cold a bit cooler…and can masquerade as a towel if someone falls in a pond. Word of Warning: Advise other attendees to bring their own or you else you will end up sitting on one corner the size of a stamp. 3. (This is a controversial one) Bring a pair of tights – tan or coloured, you decide. Handy if you realise you have a bare patch where tan should be or if the temperature should drop. 4. Dress for comfort and for style – Don’t wear a skirt (especially if it’s a short skirt) if you don’t feel right in it. Remember, on a sunny summer’s day it is possible that you will have to sit down on any free space, including the ground, which typically leads to flashing galore. Shorts are a good alternative, and styles have come in in leaps bounds due to the resurgence in interest in them on the catwalks. 5. Don’t be afraid to accessorise with scarves or jewelry. Dressing comfortably may mean dressing boringly. Personally, I love a white top and jeans look and a long necklace can really transform the look. I went to dinner in my good friend’s house last night and we sat outside until the sky was black. It was heavenly. I wore the same outfit I had worn to dinner with family on Tuesday night because it’s pretty fail safe. 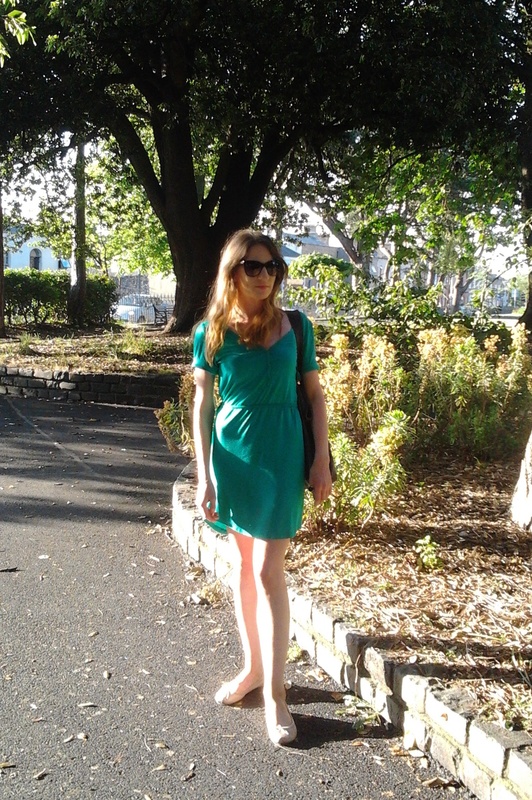 The dress is from H&M, shoes (Amy Winehouse style ballet pumps) from New Look, gold ‘torc’ from Penneys and sunglasses were free with Tatler. I felt comfy, I didn’t feel out-of-place like I usually do in the sun (because I’m a vampire) and I felt like summer could go on forever and ever and ever …. Long live the sunny days! We’re different animals.